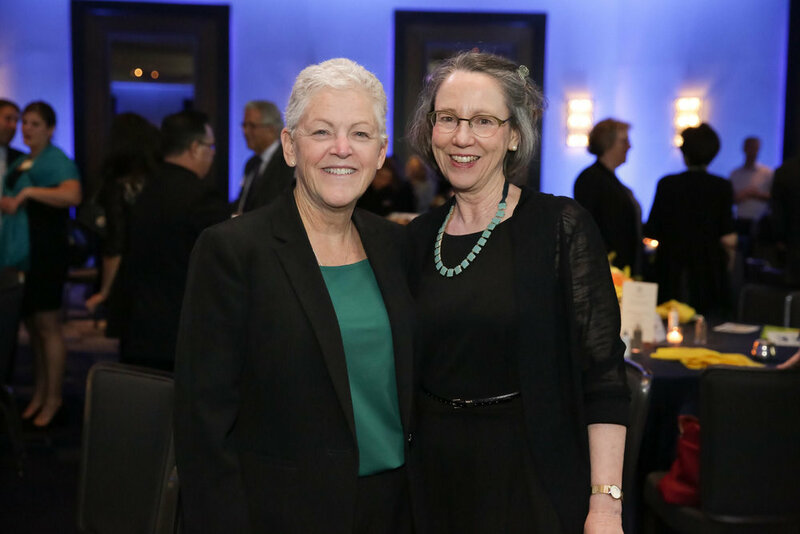 Keynote speaker Gina McCarthy and Silent Spring Institute, executive director, Julia Brody. Former EPA administrator Gina McCarthy delivered an impassioned speech at Silent Spring’s annual breast cancer prevention gala last Thursday, talking about current threats to public health, namely the threat of unregulated and dangerous chemicals in everyday products and in our environment, and the challenges in dealing with these “invisible” threats that contribute to breast cancer and other diseases. “You can’t smell the stuff that kills us now. You can’t see it, you can’t taste it. It’s in the products that are in our houses…” said McCarthy. McCarthy emphasized the critical and urgent need to support science at a time when science at the Environmental Protection Agency and other federal agencies is coming under attack. Silent Spring’s executive director and senior scientist Dr. Julia Brody highlighted the institute’s work including an innovative research program for rapidly identifying chemicals that contribute to breast cancer, a new study on how exposure during adolescence to hazardous chemicals might increase breast cancer risk later in life, and a crowdsourced study for tracking the public’s exposure to 14 common toxics. “Tonight, you have the opportunity to generate the science we need to stop making the same mistakes over again by putting untested chemicals in our environment and in our bodies,” said Brody. Norman Posner and host Kelley Tuthill, former anchor at WCVB-TV in Boston, led a paddle auction to raise funds to support the Institute’s work. The evening ended with the awarding of the 2017 Rachel Carson Advocacy Award to Nancy Drourr, a long-time supporter and breast cancer survivor, for her advocacy work and commitment to prevention research. The annual gala dinner was held at the Royal Sonesta Hotel in Cambridge. More than 250 guests were in attendance. To make a donation to the Silent Spring Institute, please visit www.silentspring.org.